Bečov nad Teplou is located 20 km south of Karlovy Vary . The castle and Chateau is situated above a deep valley surrounded by high wooded hills.. The originally Gothic castle from the early 14th century was heavily damaged during the Thirty Year War. Later it was abandoned. In the early 18thcentury, an opulent Baroque chateau was built near the castle and complemented by a beautiful Italian terraced garden. But the biggest attraction of Bečov Chateau is the undoubtedly the Reliquary of St. Maurus from the early 13th century. 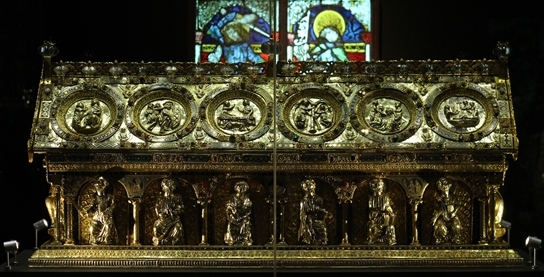 The unique Romanesque relic is a gilded casket set with gems and holds remains of saints. It was found in 1985 buried in the castle chapel. A fascinating history of the Reliquary's discovery can be found here. 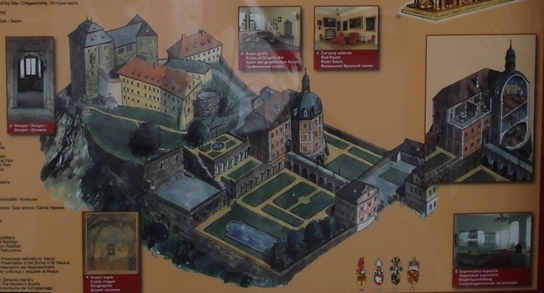 Mariánské Lázně. We regularly stay at the Hotel Bohemia whilst we are here and since the town has been covered in previous years I shall only show a few photos. Františkovy Lázně. Located near Cheb the town vies with neighbouring Karlovy Vary and Mariánské Lázně, for who has the best Spa faciltiues. We found.Františkovy Lázně very genteel and staying at the Imperial Hotel we used to enjoy strolling about the town and listening to the music being played by orchestras on the local bandstands. Loket situated about 12 kilometres from Karlovy Vary means "elbow" in English. The town got its name due to the town centre being surrounded on three sides by the Ohře River, and the shape the river takes is similar to that of an elbow. The town centre itself features Loket Castle, a 12th-century gothic castle built on a massive rock in the town. Once known as "the Impregnable Castle of Bohemia", because of its thick walls, it is one of the oldest stone castles in the Czech lands. We liked the town so much that we promised ourselves that we would come back again and perhaps stay one or two nights another year.